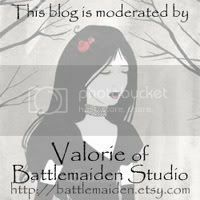 Battlemaiden Studio: Dark Doll - AUCTION CLOSED! Congrats Debbi! Dark Doll - AUCTION CLOSED! Congrats Debbi! This auction will END 10-25 at SIX PM Central time (my time). If you want to be notified if you've been outbid, leave me an E-mail address with your bid. These dolls were a combined effort on the part of several members of the Fantasy Artists of Etsy street team. Each doll comes with a journal that was also handmade from one of our members, that each artisan used to journal their process. The winner of this beauty will truely be getting a piece of art! All profit from the sale of this doll will benifit Nora and her family while she recovers from medical issues. Rules: Please only bid in full dollar amounts! 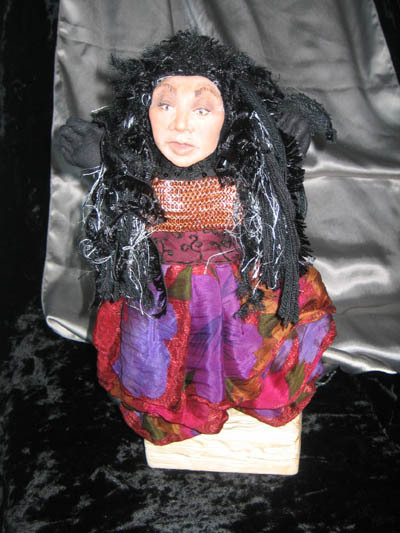 You are bidding on the Dark Doll only. To place your bid, just comment here. The winner agrees to purchase the doll through Etsy.com at the full bid price, plus an additional $10 for shipping to anywhere in the world. I will refund overcharged shipping as long as it's more than $1 through PayPal. I only accept PayPal as payment. Any questions? Let me know! Haha, my bid stands at $45.00. Light Doll - AUCTION CLOSED! Congrats Nancy!